Why does my husband have a fondness for one pot dishes, you may ask? The answer is simple enough: he cleans the kitchen and washes the dishes every night after dinner. Ergo, one pot dinners means less for him to clean up. Therefore, laziness sometimes dictates what we, as a family, have for dinner. So, I’ve experimented with various one pot dinners over the years which is difficult for me since I love to add vegetable side dishes to the table. I’ve discovered that anything made with Spanish Chorizo goes over well and chicken thighs are so succulent and juicy that they are nearly impossible to ruin. Add some spice to the mix, throw in some veg and this one pot chicken dish was born. It’s fairly easy to throw together and you could even try it out in the slow cooker. With the added allure of crispy chicken skins to garnish, it’s a bit of a show stopper. So, if you need a hearty dinner to put on the table or even if you want to impress guests without making a huge mess, serve up a big beautiful bowl of ‘kind of Cajun’ chicken thighs! In a medium to large pot, heat 1-2 tbsp of oil over low to med heat and add chopped chorizo. When the oil has taken on the color of the chorizo, add onion, carrot, celery, green chiles and garlic. Continue cooking on medium to low heat until the vegetables are soft then add thyme, oregano, bay leaves and paprika. Meanwhile, pull chicken skin off the thighs and set aside. Cook the spices and chorizo veg mix for a minute or two then add 1 cup of wine to deglaze the bottom of the pot. Increase heat and bring to a boil. When wine has reduced slightly, add stewed tomatoes (if tomatoes are whole, make sure to crush the tomatoes by hand before adding them) and chicken broth and bring to a low boil. When the mixture is bubbling, add chopped okra and skinless chicken thighs making sure the meat is fully submerged in the sauce. Reduce heat to low, cover and allow to simmer for 30 min. While chicken is cooking in the stew, transfer the chicken skins to an oven sheet, sprinkle with salt and pepper (season only if not already brined, if skins are brined then do not season) and cook in the oven on 200C/400F until crispy (about 10-15min). When chicken is fully cooked, season to taste with salt and pepper and thicken with cornstarch mixed with 4 tbsp water . Spoon chicken and sauce over mashed potatoes, rice or pasta. Garnish with crispy chicken skin and enjoy! When the oil has taken on the color of the chorizo, add onion, carrot, celery, green chilis and garlic. Continue cooking on medium to low heat until the vegetables are soft then add thyme, oregano, bay leaves and paprika. Meanwhile, pull chicken skin off the thighs and set aside. Cook the spices and Chorizo veg mix for a minute or two then add 1 cup of wine to deglaze the bottom of the pot. Increase heat and bring to a boil. When wine has reduced slightly, add stewed tomatoes (if tomatoes are whole, make sure to crush the tomatoes by hand before adding them) and chicken broth and bring to a low boil. 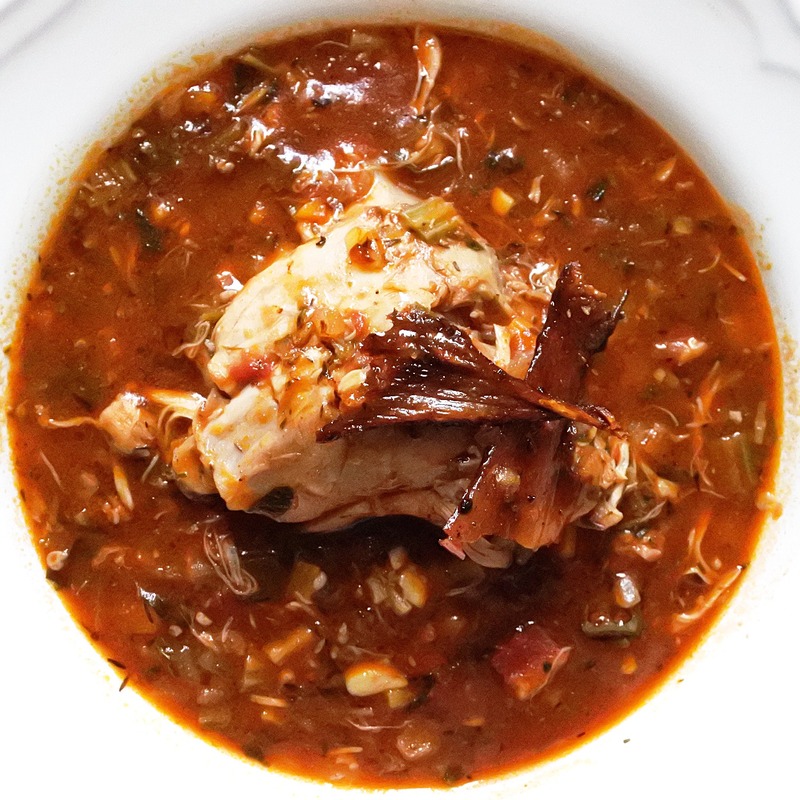 When the mixture is bubbling, add chopped okra and skinless chicken thighs making sure the meat is fully submerged in the sauce. Reduce heat to low, cover and allow to simmer for 30 min. While chicken is cooking in the stew, transfer the chicken skins to an oven sheet, sprinkle with salt and pepper (season only if not already brined, if skins are brined then do not season) and cook in the oven on 200C/400F until crispy (about 10-15 min). When chicken is fully cooked, season to taste with salt and pepper and thicken with cornstarch mixed with 4 tbsp water . Spoon chicken and sauce over mashed potatoes, rice or pasta. Garnish with crispy chicken skin and enjoy!